Personnel from the Government Railway Police on Wednesday recovered suspected Morphine during a routine checking from inside coach no A-5 from the 12423 DN Rajdhani Express at platform number one of the Guwahati Railway Station. 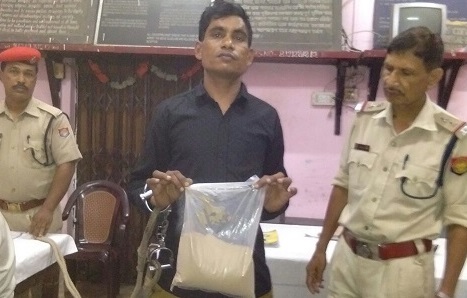 The suspected Morphine weighing approximately 900 grams was recovered from the possession of one passenger identified as one Ibadul Haque who was in seat no 52 of coach number five of the 12423 DN Rajdhani Express. The 48 years old haque is the son of Lt Abdul Haque, a resident of Katra under Kotwali police station of Barabanki district in Uttar Pradesh. During preliminary interrogation, it was learnt that the offender brought the said drugs from Dimapur and was expected to deliver it at Kanpur Central. Meanwhile, further investigation is on.